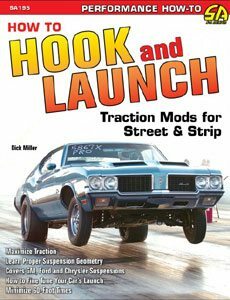 At the beginning of my 40-plus years of drag racing, someone with a fairly consistent car and good starting-line reflexes could win his or her share of drag races as I did on national, state, and local levels. When I first started drag racing 60-foot clocks did not exist. I can even remember running time-trials four cars wide. As the years passed, new things were developed to level the playing field. Even 40 years (and many different cars) later, I still win races and track championships in the same car I started in, but times have changed. 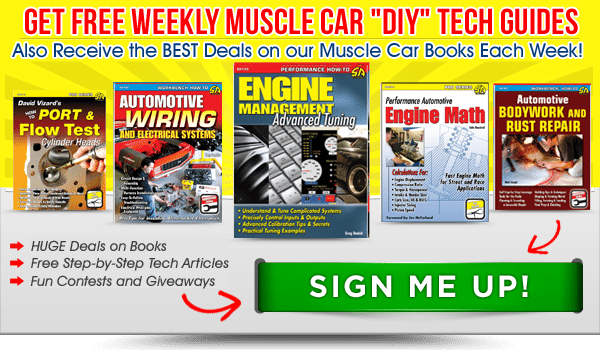 This chapter discusses several ideas for making your car more consistent. The more consistent your car is, the more races you can win. A consistent car also allows for more accurate data when testing new combinations and therefore a faster car. You may already have many of them on your car and you may have heard of others but have not given them much thought. In comparing 26-inch tall tires with 28-inch tall tires, the difference in rollout distance can be seen. You can use this difference to your advantage if you take it into account when staging the car. 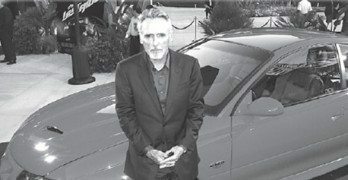 One of the advantages of running one car for more than 40 years (even though I have had many others) is that I have tried almost every product on the market and know what works and what doesn’t. I have tried many things that I quickly got rid of because they just didn’t work as advertised. Other times there was something else out there claiming to be better, and I wanted to try it instead. As a result of all this experimenting, I have found eight things (in no particular order) that I feel every bracket racer should have. If you look at the racers who win, they are already incorporating these exact ideas, or something similar. Gone are the days of a good driver winning on his skills alone. Don’t misunderstand me. Experience helps make the right decisions but knowledge and information help take the guesswork out of those decisions. The correct-diameter front tires for the best 60-foot times and best reaction-time combinations are different for every driver and car combination. The same things hold true for either foot-brake cars or transbrakeequipped cars. Tire diameter can adjust your 60-foot times, but also affects your reaction times, so you need to compromise to achieve the best-possible front tire for you and your car. Since it is hard to adjust the driver sometimes, a differentdiameter front tire is the best way. The taller tire has more of a rollout (larger circumference) and therefore the better your 60-foot clockings are. Mickey Thompson front tires with a 26-inch diameter have a rollout of 78 inches. The same tire in a 28-inch diameter has a rollout of 86 inches. 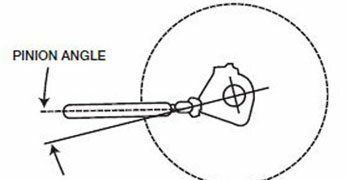 Unless you are deep staged (staging enough forward that the pre-stage light goes out), normally your front tires have the leading edge of the tire breaking the staged beam (photocell) while the trailing edge is still breaking the pre-staged beam. With 7 inches between the stage beam and the pre-staged beam, the tire is able to roll at least 7 inches more before leaving the stage beam and activating the red light. If your front tire has a circumference of 86 inches, it is able to roll farther than a tire with a 78-inch circumference. Not only is your car able to move the 7 inches, but it also gains the distance provided by any amount of tire diameter still left in the pre-stage beam as you are breaking the stage beam. This is like a rolling start! With the larger-diameter tire having more distance before exiting the pre-stage beam, the 60-foot time is quicker than for the same car with smallerdiameter tires. The same holds true for the rest of the times recorded farther down the track. Reaction time is based on the actual time from when you exit the staged beam and the light turns red or green. Therefore, if you have a taller tire the 60-foot times (rolling start) are quicker, but your reaction time is slower due to the longer rollout required before the tire exits the staged beam. Normally, for winning races, I say go for the best-possible reaction time. In bracket racing, it’s not how fast you get there but how consistently you get there coupled with a great reaction time. The whole picture can become very complicated. Let’s say you have the right tire (usually the tallest tire) for your best 60-foot times ever, but your reaction time needs to improve. One quick thing to look at is front-tire air pressure. Lower front-tire air pressure creates a longer rollout, and higher front tire pressure creates a shorter rollout. Likewise, less front-tire air pressure creates a larger footprint, meaning there is more tire left in the pre-stage beam for a quicker 60-foot time and a slower reaction time. 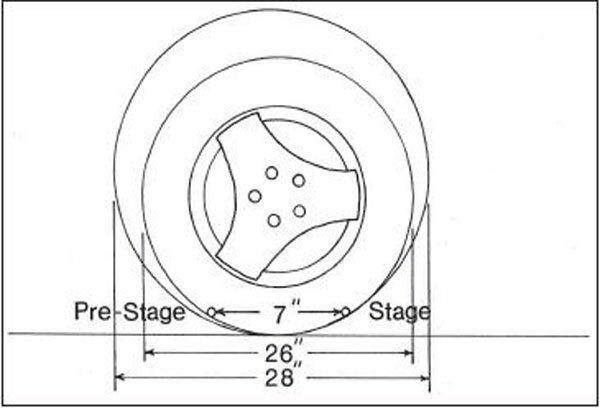 Higher front tire air pressure creates a smaller footprint, meaning there is less tire left in the pre-stage beam for a slower 60-foot time and a quicker reaction time. I have even seen cars with one side tire-and-suspension assembly removed and reattached farther rearward to create a much longer rollout. 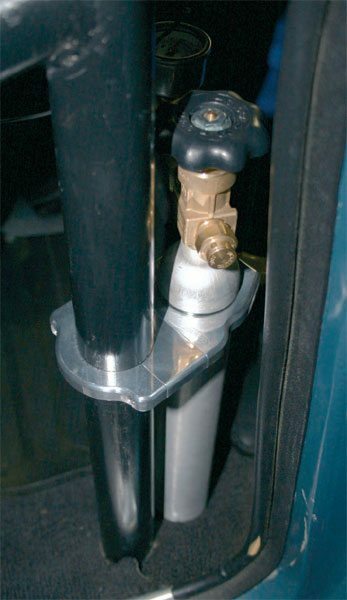 Accelerator linkage can be adjusted as well; not only at the pedal but also at the carburetor. Be sure the engine responds as quickly as possible when you press down on the gas pedal. The race cars of today have more and more electronics than cars of the past, including the possibility of electronically controlled shifters, transmission brakes, shock adjusters, programmable ignitions, data recorders, and more. I refer to them that way (cars of the past) because most drag race cars of today are cars of the past no matter how modified they may be. While it is not unusual to see a car run 9.50-second ETs, that was what a Pro/Stock car ran 40 years ago. There are many reasons for these advancements, but almost all of them besides tires (see Chapter 9) need more and better electronics to utilize these new improvements. Remember, no one single combination fits all. It is up to you to see what would make you and your car the best winning combination possible by working on your reaction time and 60-foot time. Most race cars today run an alternator to be sure the battery is in the best condition possible for each run, all the way through the run. Unless you enjoy charging your car’s battery between runs, at the very minimum you should go to a 12-volt alternator such the one-wire units available from Powermaster that generate 70 amps at idle. That means not only is the alternator charging the battery going down track, but also while on the return road and while idling in the pits or staging lanes, or any time the engine is running. Being from the old school, old habits die hard. After changing to a one-wire Powermaster alternator, I still charged my battery between rounds. I like to double-enter some races, which means there is even less time between rounds. So I bought a voltmeter, and by monitoring it between rounds I found it wasn’t necessary to charge my car’s battery between rounds, or even at all. I use a 12-volt battery tender between events to be sure the battery is at full charge before the next race. For experimental purposes, I recently installed an XS Power 16-volt absorbed glass mat (AGM) maintenance-free battery and corresponding Powermaster 16-volt alternator. I expected to see a safety margin in reserve voltage available at the track between rounds. What I also got (and didn’t expect) was all my electrically-powered accessories (including the cooling fans, water pump, and fuel pump) ran at a higher RPM. They were all noticeably faster and I could hear the difference. My engine (with 509 ci and 12.5:1 compression) starts quite hard on occasion; especially after it has some heat in it, and sometimes it kicks back against the starter. 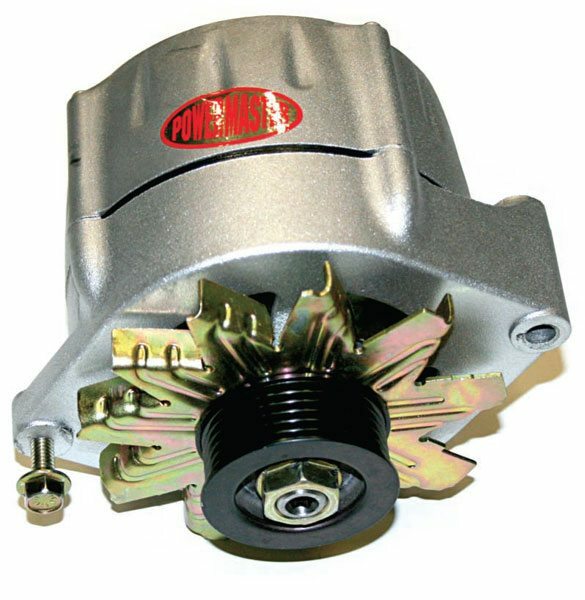 Here is a typical Powermaster high-performance alternator. Other manufacturers offer similar products, but I choose Powermaster after many years of using them without issues. The company’s wide range of products means it should have an alternator to replace a factory unit directly and offer improved charging potential. Switching from a 12-volt battery to a 16-volt battery also requires a 16-volt alternator like this one from Powermaster. This is an XS Power 16-volt AGM battery. 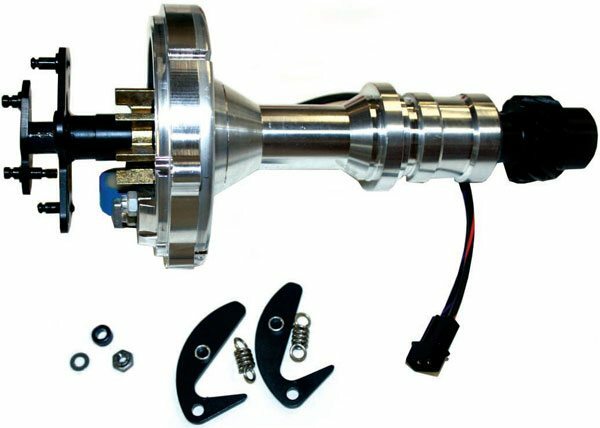 They never require maintenance and offer higher voltage levels to crank over high-compression racing engines with relative ease. They also last longer than traditional flooded-cell batteries, and don’t require a perfectly level mounting. 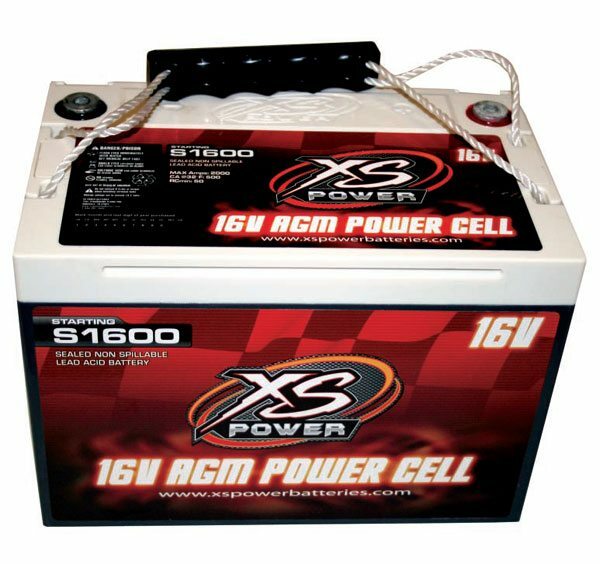 Competing AGM batteries made by other manufacturers offer similar benefits, but I’ve had good luck with the XS Power product. The 16-volt battery from XS Power does not have all the same holddowns as some factory batteries. I contacted Advanced Chassis to make me a new bolt-in battery tray. With this setup, it sounds like a completely different engine when turning over. The starter spins it over so effortlessly it sounds like the car has no spark plugs. Since I still carry my battery in the stock location, I bought a new battery tray and holddown fabricated that bolts right into the factory spot. Of course, a 16-volt battery charger is needed to keep 16-plus volts in the battery. When fully charged, the battery should hold 19.2 volts. AGM batteries have high coldcranking amperages and hold a charge for a much longer time. There is no liquid acid in an AGM battery. They never need liquid added, are maintenance-free, are non-spillable, and they can be mounted in any angle except completely upside-down. They do contain vents which are normally closed, but should the battery be overcharged and internal pressure build up, the vents open to release it. This is a very rare occurrence; however, and today’s maintenancefree AGM batteries are highly recommended, as they are better in every way than the traditional flooded lead-acid batteries they replace. Another area of importance for saving power is the starter. I run a Powermaster XS Torque Starter. Not only does it take up less space (giving me more header clearance) but with its aluminum case, it weighs only 8 pounds—about half the weight of a normal heavy-duty starter. 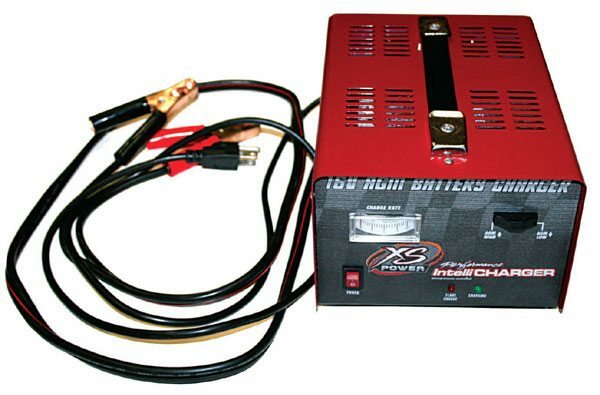 A 16-volt battery charger like this one from XS Power is a must for a 16- volt battery system. A 12-volt charger cannot keep the 16-volt batter at full charge. It can also be used as a battery maintainer between races, lengthening the life of the battery. 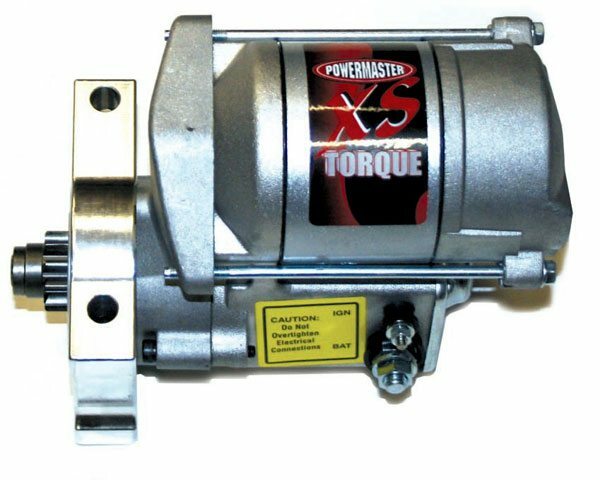 High-torque starters like this one from Powermaster are capable of starting engines with 19:1 compression and are reliable start after start. They also run cooler due to more header clearance. 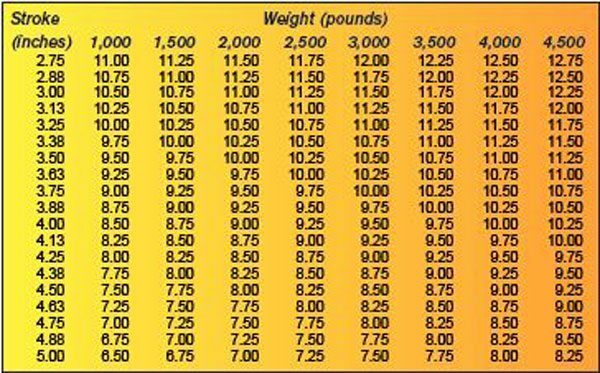 Remember, less weight means quicker ETs. Research has shown that 100 pounds equals approximately .10 second in ET. By being smaller in size and farther away from the engine block and exhaust headers, the starter doesn’t soak up as much heat. Therefore, its tolerances are maintained much better and it starts the engine more easily when the engine temperature is higher, raising compression. It has 200 ft-lbs of cranking power and uses a 4.4:1 gear reduction design to be able to get the job done, even with engines pushing up to 18:1 compression ratio. One of the things that helps my car run so consistently is the shifter. The last time I raced, it ran 7.04, 7.04, 7.03, and 7.03 in the late afternoon and early evening. Over the years, I have used many shifters ranging from the factory style to the aftermarket ratchet style to electrically-activated units and air-shifted units. The Precision Performance Products shifter provides solid movement of the shifter at exactly the same RPM for both shifts, time after time. And it looks good. This is the complete Precision Performance Products automatic shifter including a carbon dioxide bottle. The only thing still needed is an RPM-activated switch for perfect shifts run after run. 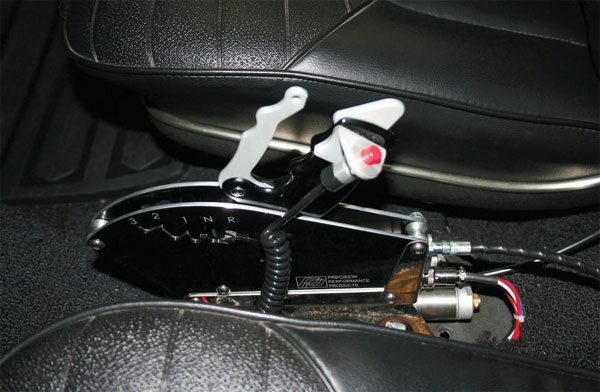 This Precision Performance Products shifter has an aircontrolled actuator underneath the actual shifter. A shot of air from the RPM-activated switch opens the air solenoid and provides a momentary shot of air to the actuator and moves the shifter into another position. The Precision Performance Products shifter installed very neatly between the seats of a 1970 Cutlass W-31. 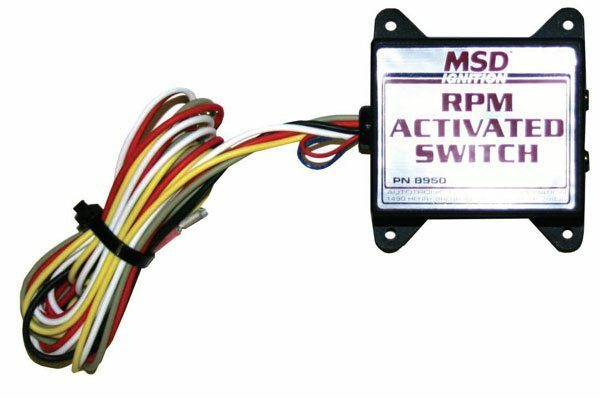 This RPM-activated switch from MSD plugs into the MSD box and uses RPM chips to control when to provide carbon dioxide to the shifter. If you want to change shift RPM, just change to another chip. The model I am using is a reverse pattern. It is triggered by an MSD RPM switch and is operated by a carbon dioxide bottle. Like everything else, I felt I needed a backup carbon dioxide bottle, which is a good idea, but I have been using this shifter for well over a year now on the same bottle. It can be used for standard- or manual-valve bodies, with forward or reverse patterns, and is complete with a neutral safety starting switch, a reverse lockout switch, and a transmission brake switch. Even though I run in the the foot-brake class, I like having a transmission brake. 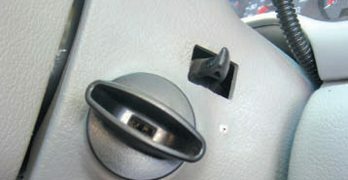 The good thing about a transmission brake switch is that if you roll into the staged beam too far and wish to back up (which is typically not allowed) and your competitor is already pre-staged, you can simply put the shifter into neutral, hit the transmission brake button, and the car is in reverse. You can back up and quickly shift back into first gear, usually before anyone even knows what happened. It’s much quicker and easier than shifting into neutral, pressing the reverse lockout button, shifting into reverse, backing up, shifting into neutral, and then shifting back into first. Weather stations have gotten more affordable over the years. 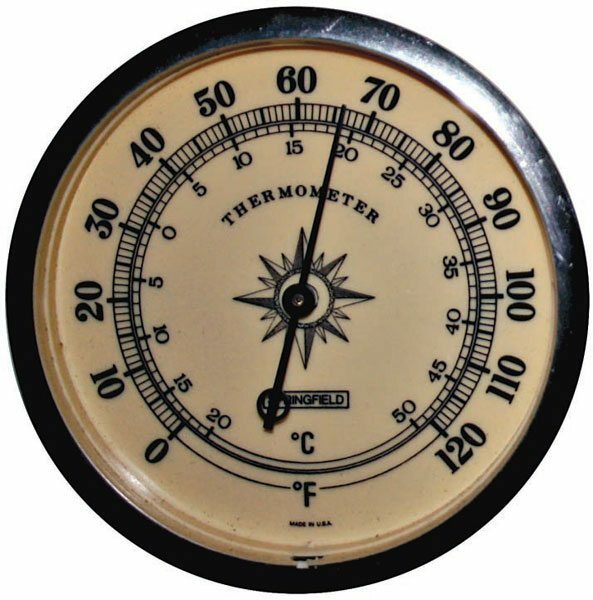 When I first started racing, all that was available were temperature, humidity, and barometer gauge sets. By recording old runs and the gauge settings you could fairly predict your next run’s ET or dial-in. The old seat of the pants or just experience worked great also if there were no changes in the weather but should a weather front come through, without consulting any gauges, your ET would probably change and you could be on the trailer wondering why. Back then local track bracket points chases were pretty well a weekly affair. Such experience pretty wellseparated the every week racers from the under experienced once in a while racers. Changes in the quality of air (density) not only could slow down or possibly speed up a car but also might require a change in fuel mixture. Air density gauges came later in the 1980s. Air density decreases with increasing altitude as does barometric air pressure. It can also change with changes in temperature and/or humidity. The less dense the air, the less power your engine makes and the slower the ET. Also, less oxygen is present in less dense air so you will need to adjust your fuel mixture to a leaner condition. Air density depends on temperature, barometric pressure, and how much humidity is in the air. 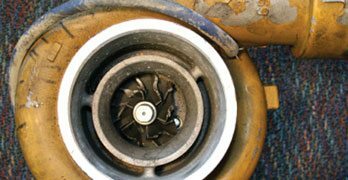 If an engine was at optimum air/fuel mixture while in denser air and less dense air moved in, the engine could be in an over-rich condition. This could create a condition anywhere from not noticeable to seeing black smoke coming out of the exhaust upon acceleration.
. Be sure you mount the carbon dioxide bottle in a secure and upright position and somewhere you can reach it without too much trouble for that time when you just remembered you forgot to turn it on for the day’s activities. An air density gauge can help you when recording runs in your log book. While this is not necessarily harmful to your engine for a short time, if severe enough, this may fowl out the spark plugs which will add to the power loss. Changing the fuel back to its optimum mixture you gain back some of the power lost. You can’t do anything in a naturally aspirated engine (no power adder) to ever get back all 100 percent of the power lost in less dense air. If the air becomes more dense then the car can make more power. Due to the denser air you must richen your car’s fuel mixture back to optimum air/fuel mixture, which will make even more power. However, not richening back to optimum air/fuel mixture causes a lean condition. Depending upon how drastic the air density has changed, this could show as a pulsating miss at the top end of the track or a bog off the starting line. 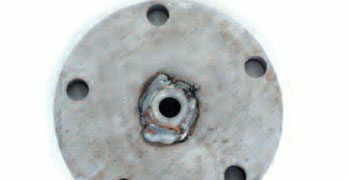 Over lean conditions can over a period of time burn pistons, rings, and/or valves thus making for a very expensive repair. 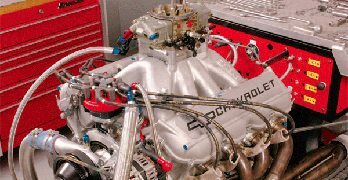 A race car’s engine is an air pump and a naturally aspirated (no power adders) engine can only pump a certain volume of air. The density of that air can dictate how much power that engine can make. Increasing barometric pressure increases the density. Using an air storage tank as an example, if it contains 20 pounds of air pressure and you add more air to the same tank the pressure will increase corresponding to the amount of air you add yet it is still in the same size container. Since a race car’s engine is an air pump, denser air being pumped into the cylinders needs a richer mixture, therefore making more power. Lower barometric air pressure creating less dense air needs a leaner mixture, therefore making less power. Altitude and barometric pressure can both change the air density. As you go higher in altitude, such as in the mountains in Denver, the air density decreases just as going to sea level or lower will cause an increase in air density. Weather changes can change the barometric pressure either higher or lower and will also affect the air’s density, but not nearly as much as altitude. Barometric pressure is higher on a nice cool sunny day, meaning denser air. If an afternoon storm comes in the barometric pressure will lower as will the air density. The barometric pressure again increases raising the air density as the storm passes. Therefore, air density is at its lowest at a high elevation on a hot day when the barometric pressure is low. The air’s density is highest at low elevations when the barometric pressure is high and the temperature is low. Higher air barometric readings mean denser air and more power, indicating a possible leaner engine condition. The same in reverse if the barometric reading gets lower. Lower air temperature means denser air and more power, indicating a leaner engine condition. The same in reverse if the air gets warmer. Lower humidity readings indicate denser air and more power, indicating a leaner engine condition. The same in reverse if the humidity gets higher. Temperature has the opposite effect on air density as does barometric pressure. Using a balloon as an example, heating the air captured in a balloon expands the balloon just as cooling it causes it to shrink. How-ever, the same hot air not in a balloon (surrounded by nothing but air) pushes the surrounding air aside. As a result, the amount of air in a particular area decreases when the air is heated if the air is not captured as in a balloon. In normal atmosphere the air’s density decreases as the air is heated. This makes less power and requires a leaner fuel mixture change due to the less oxygen available with the less dense air. Likewise the air’s density increases as the air is cooled. This makes more power and requires a richer fuel mixture change due to the more oxygen available with the more dense air. Even though I explain how humidity effects air density I am not sure it has the power-robbing effect on performance you might expect as with barometric pressure and temperature. Humidity (vaporized water) when mixed with an exploding charge of a fuel and air mixture will explode itself, and create steam which being in a confined space will also help to develop horsepower. Humid air is less dense than dry air. Scientists explain that a fixed volume of gas, let’s say 1 cubic foot, at the same temperature and pressure, always has the same number of molecules no matter what gas is in the container. Imagine a cubic foot of perfectly dry air. It contains about 78 percent nitrogen molecules, with each molecule having a molecular weight of 28. Another 21 percent of the air is oxygen, with each molecule having a molecular weight of 32. Molecules are free to move in and out of that 1 cubic foot of air. What scientist lead us to conclude is that if we added water vapor molecules to that 1 cubic foot of air, some of the nitrogen and oxygen molecules would leave (remember the total number of molecules in one cubic foot of air stays the same at the same temperature and pressure). The water molecules, which replace nitrogen or oxygen, have a molecular weight of 18. This is lighter than both nitrogen and oxygen. In other words, replacing nitrogen and oxygen with water vapor decreases the weight of the air in the cubic foot and density decreases. Compared to the differences made by temperature and air pressure, humidity has a small effect on the air’s density. But, humid air is lighter than dry air at the same temperature and pressure. Isn’t water heavier than air? If you pour water in a bucket doesn’t it go to the bottom with the air on top? This is true in a liquid form. But, the water that makes the air humid isn’t liquid. It’s water vapor, which is a gas that is lighter than nitrogen or oxygen. When humidity reaches 100 percent it is then a liquid falling from the sky to the bottom of the bucket. 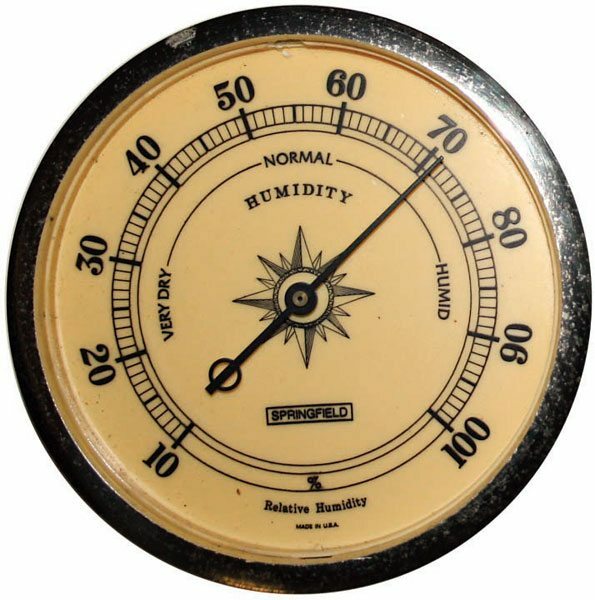 Humidity is measured as a percent-age of the ratio of the current absolute humidity to the highest absolute humidity possible. This is water vapor that a given amount of air can contain with 100 percent being the maximum amount before it returns to a liquid state and falls out of the sky as rain. Humidity doesn’t have to be at 100 percent at ground level before rain can occur but it must be 100 percent somewhere in the clouds above the earth. A reading of 100 percent relative humidity means that the air is totally saturated with water vapor and cannot hold any more, creating the possibility of rain. The amount of water vapors the atmosphere can hold before reaching 100 percent depends upon on the current air temperature. Warmer air can evaporate more water vapors than cooler air. Thus, on any given day if the temperature rises the humidity level will decrease. As the cool night air comes in the same amount of water vapors in the air will give a higher humidity reading. Therefore, with the cooler night air and the same amount of water in the air the humidity will read higher yet more power is available because the cooler denser air now has more molecules. Since the water molecules are the same number there will be more oxygen and nitrogen molecules even with a higher humidity reading. While we are talking about air density also consider that denser air will slow down objects moving through it more than less dense air because the object has to shove aside heavier molecules. Such air resistance is called “drag,” which increases with air density. Cool, dense air creating more drag will slow a muscle car’s acceleration rate; however, the additional horsepower created with this denser air will compensate for the drag and accelerate the car faster. Turbochargers or superchargers are ways of increasing the density of the air going into an engine. Years ago, I developed my own computer program that recorded run information and the air density for each run. Then, given the new air density, I could look up all runs with the same air density. Weather stations kept evolving into more sophisticated instruments. Not too many years ago at a very big NHRA race in Memphis, I made it to the final round. There was a storm coming in and it got cloudy and cooled off several degrees. My opponent did not have a weather station/ET predictor. He dialed his car quicker as I would have also done based upon the cooler air. 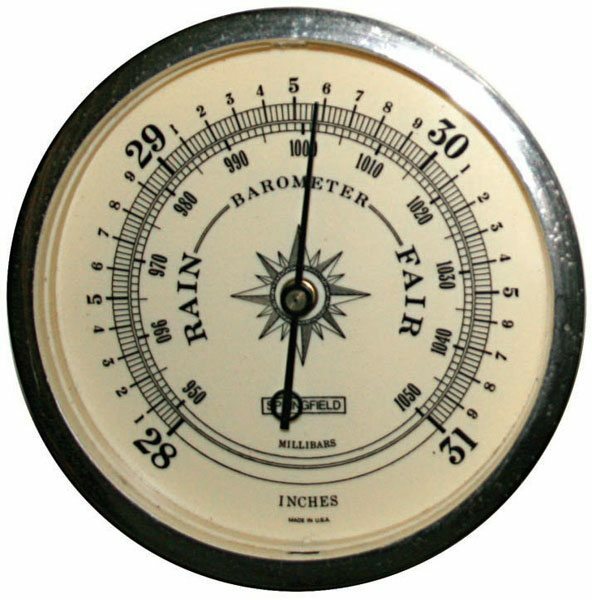 I consulted my local weather station and it indicated that with the coming storm and lower barometric pressure the air had gotten worse. I dialed my car slower. I took home the Wally. 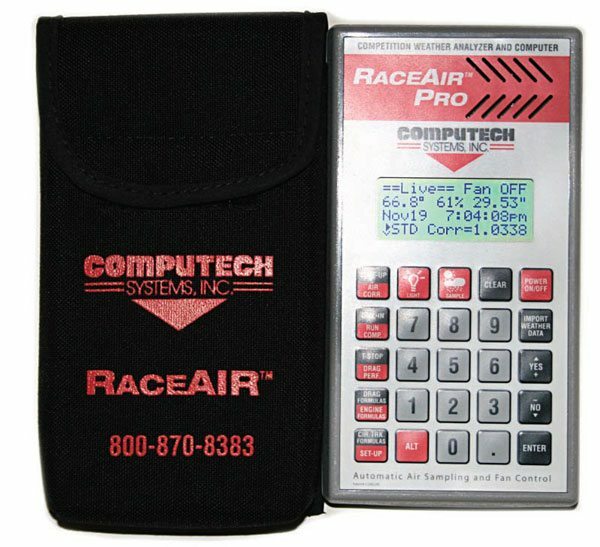 I use the Computech’s RaceAir Pro Competition Weather Analyzer and computer. Notice the and computer, as they now predict dial-ins, calculate jetting changes needed, throttle stop timer settings, many mathematical calculations, are used as a calculator, and run completion calculations based on partial runs. When turned on, the Computech analyzer shows from memory the weather station readings from the last time it was on. Press the sample button and the analyzer turns on the fan which draws fresh air through the unit to get the current readings. This takes a few minutes before it will read “Sampled Weather” indicating it has fresh information. I have noticed if you move it around while it is sampling the air it takes longer to perform the sampling. Do not set it in the sun when sampling or near any other sources of heat such as your exhaust or even your own body heat. Computech’s Race Air Pro Weather Station complete with carrying case keeps you current as to weather changes, and expected ET based on those changes. 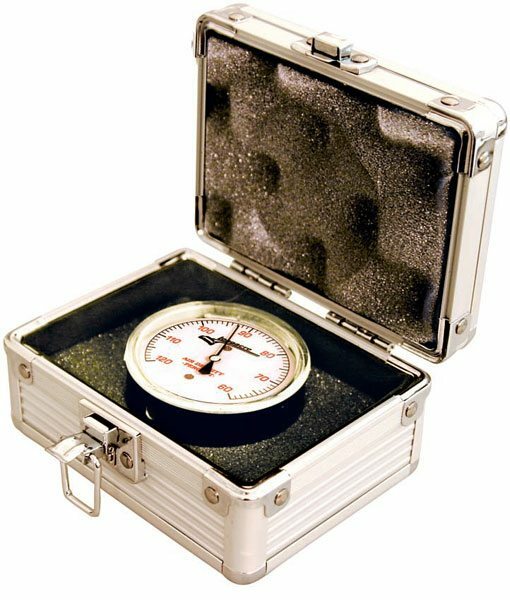 Once the air has been sampled, it displays current temperature, humidity, barometer readings, correction factor, and air density, among many others. I record all of the settings after each run on the ET slip and in my log book for reference material. For predicting dial-ins the only numbers you need is the correction factor. The higher the number the worse the air and the lower the correction number the better the air. Let’s say at 13:36 you ran your last time trial flat out with no lifting, and ran a 6.8747. When you returned to the trailer the analyzer correction factor was 1.0331 (70.7 degrees – 30 percent – 29.49). Due to some track problems your first round of eliminations wasn’t until 16:24 (2.48 hours later). Running a fresh sample before you head to the staging lanes the correction factor now reads 1.0368 (72.8 degrees – 30 percent – 29.47). Press the dial-in key and the analyzer asks for the old correction factor. You enter the 1.0331. Now the analyzer needs the old ET, so enter 6.8747. The analyzer now asks if you want to use the current correction factor of 1.0368. If you don’t, enter the desired correction factor. If you do, just press enter and the analyzer indicates based on your last run compared to the present air conditions that your run should be 6.883. This run would be more in the middle of the day when the temperature is normally higher, causing the car to slow down. There are exceptions to every rule, but drag race cars weighing less than 3,000 pounds and running an automatic transmission are better off with a 2-speed Powerglide transmission for consistency. This is because the Powerglide has a higher (lower numerically) first gear and the fact that only one shift is required instead of two. However, for cars weighing more than 3,000 pounds, the lower first-gear ratio of a Turbo-Hydramatic transmission is needed to get the extra weight to move from a standing start. 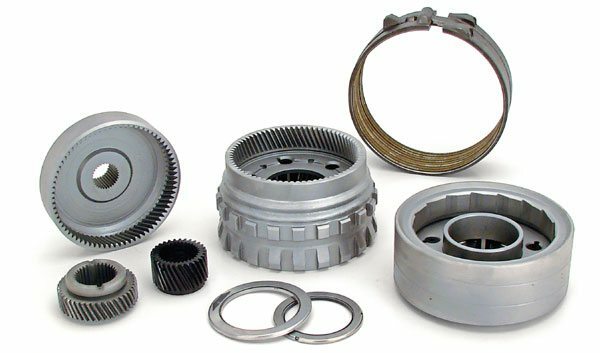 Also, because of the lower first-gear ratio, the middle (second) gear is required to bridge the gap between the low first gear and third gear. That seems pretty simple, and if that were all there was to it, it would be. Both transmissions have a final gear ratio of 1:1, so once in the final (top) gear, they both perform the same. The big difference is the first-gear ratio. From the factory, a Powerglide transmission has either a 1.76:1 or 1.82:1 first gear. Different-ratio first-gear sets are now available (through TCI Automotive, JW Performance Transmissions, and others) for the Powerglide transmission. The Turbo 400 transmission has a first gear of 2.48:1 and second gear of 1.48:1. What becomes the issue here is how you can overpower the rear tires with too much starting-line ratio. 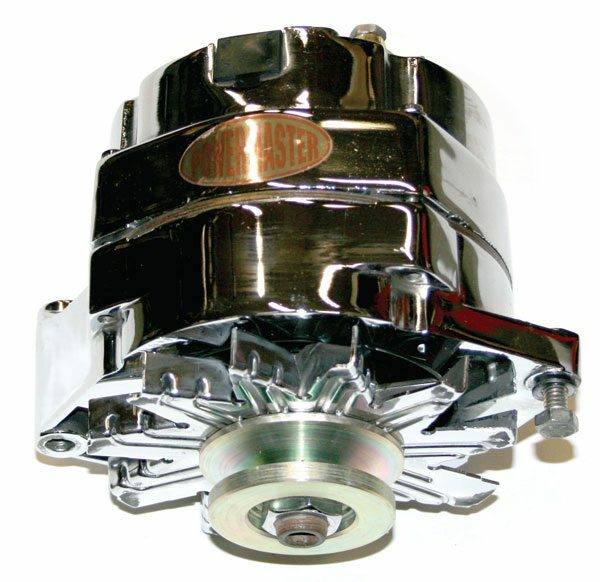 For dedicated drag racing cars, the modern versions of the old GM Powerglide 2-speed transmissions (like this one from TCI) may be ideal. They are certainly strong—capable of handling more than 1,000 hp with ease. Their gear ratios can be tailored to best suit your vehicle’s requirements. 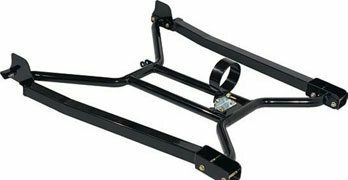 They are best used in lighter-weight vehicles, including dragsters. 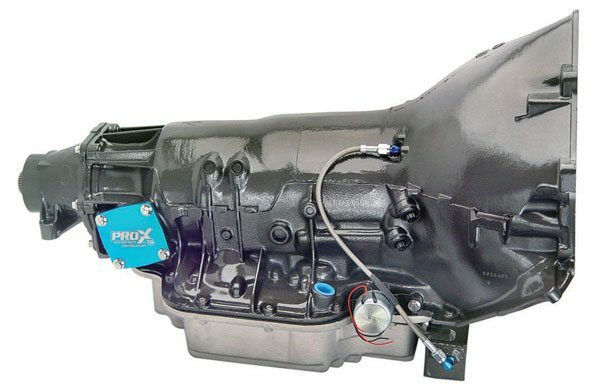 This GM TH-400 transmission is from TCI, and is suitable for heavier cars. It can handle big power reliably, and various first-gear ratios are offered. This particular TH-400 has the desirable 2.10:1 first gear. The key to making an automatic transmission live in a heavy car with a lot of power lies in fortifying it with beefy internal components (such as these TCI goodies, including a six-pinion planetary set and additional clutches) and keeping the transmission fluid cool. 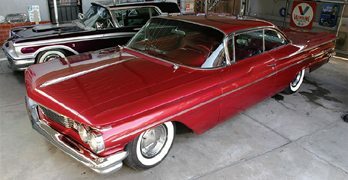 My car (with me in it) weighs about 3,800 pounds. My engine has a 4.5-inch stroke. 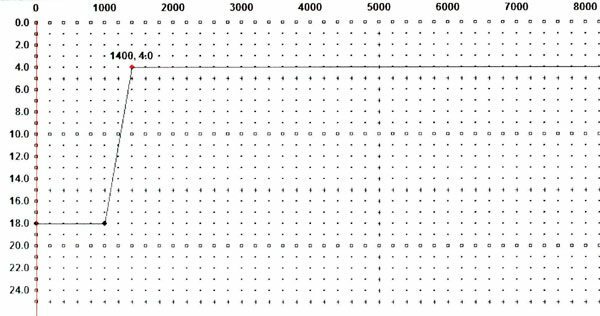 According to the chart on page 111, a 3,800-pound car with a 4.5-inch-stroke engine should have a starting-line ratio of 8.90:1 (between 8.75 and 9.00:1). However, when we take my first-gear ratio of 2.48:1 and multiply it by the rear-end ratio of 4.10, we get 10.17:1 for a starting-line ratio. To correct the situation, I can change the rear-end gear ratio to something around 3.59:1 since 8.9 ÷ 2.48 = 3.59. However, that also changes second and third gears, and affects acceleration throughout the whole run. The other option is to change the first-gear ratio in the transmission. 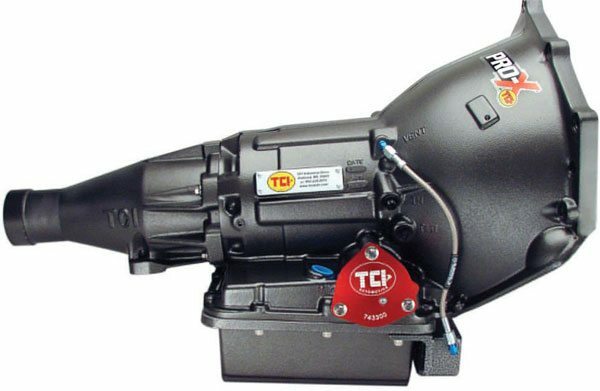 Manufacturers such as TCI Automotive offer complete gear sets (or complete transmissions) with a first-gear ratio of 2.10:1. Now my starting-line ratio is 2.10 x 4.10, or 8.61:1, and I have corrected it without changing acceleration the rest of the way down the track. If you are a one-person crew, a data recorder is necessary. There are different types with many channels to record different events, but one that records both engine RPM and driveshaft RPM is adequate. 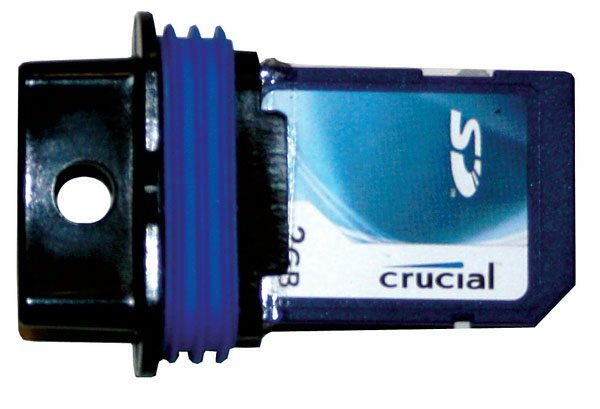 When looking around for a new one, I kept hearing the same thing from other racers: The Sportsman Data Recorder from Racepak was a great unit. I now have one, and (if you’re willing to invest the time) it can provide a lot of valuable information. Weighing less than 1 pound, measuring about 6×4.5×1 inches, and mounted under the passenger seat, you’ll never know it’s there until you’re ready to download some data to analyze. 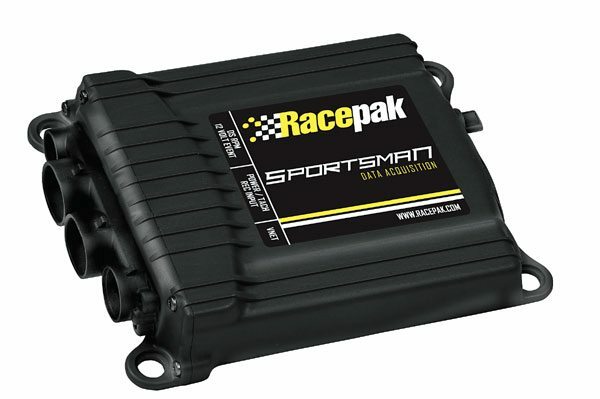 Keeping track of data during the run is a job for a data recorder, such as this Sportsman unit from Racepak. It monitors all your vehicle’s critical functions on every pass and allows you to track performance from run-to-run. This makes it much easier to judge the gain (or loss) from tuning changes. The data is recorded onto this compact memory card, which is just like the ones used in modern digital cameras. Most newer desktop and laptop computers have ports these memory cards can be plugged directly into, making it easy to download all the information gathered. This cuts down on bulky cords and wires, and makes using a data recorder easy and effective. It comes with software to install on your laptop. You can either connect it to your laptop (with a provided cable into a serial port) or it has provisions for an SD memory card that can be plugged into the laptop directly. Mine records engine RPM, driveshaft RPM, battery voltage, and lateral g-force as well as acceleration g-force. Samples of data can be recorded at up to 100 times per second. I have the advantage of seeing more numbers on the screen associated with the graphs than printed here. 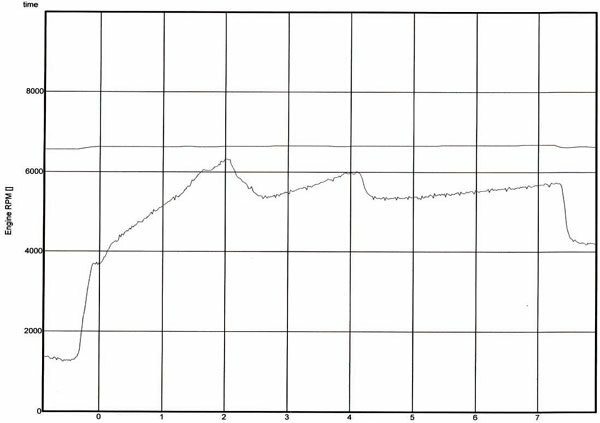 Take a look at Graph A below; this tells me the car was a foot brake car idling at the light about 1,600 rpm. 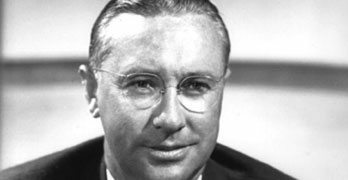 Once the accelerator was depressed toward the floor, it took .242 second for the torque converter to reach a stall speed of about 3,750 rpm. Part of that was time needed to fully depress the accelerator. In another .112 second, the driveshaft began to move the car. The first- to second-gear shift was made at 6,320 rpm, while the second- to third-gear shift was made at 6,000 rpm, and I crossed the finish line at 5,671 rpm. Since this is also a quarter-mile race car, it shouldn’t cross the finish line at a higher engine RPM than the shift points. Even though the car was shifted at exactly 6,000 rpm on both shifts, the one-two shift is not as responsive as the two-three shift. Also at the one-two shift, it appears there was a little tire slippage shown in the driveshaft curve and even more in the two-three shift. How would I have known any of this without the data acquisition system telling me? Graph A. This is a typical chart generated by the data recorder. 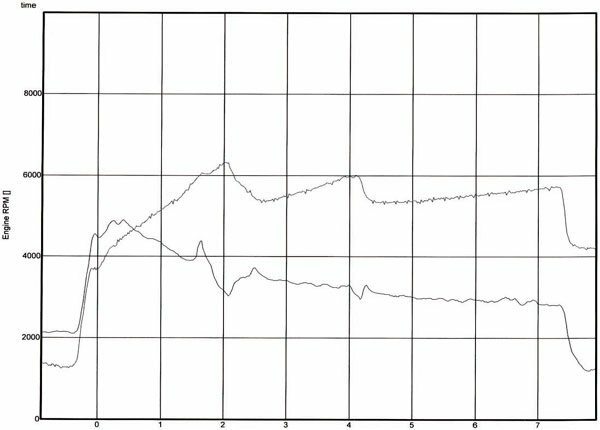 It shows both engine RPM (top line) and driveshaft RPM (lower line), which allows you to see any radical changes between them. If the driveshaft RPM suddenly spikes, it’s an indication of tire spin. This run was just about flawless, as driveshaft RPM gained steadily and both shifts were close to 6,000 rpm. Graph B. Here’s another chart courtesy of the data recorder. 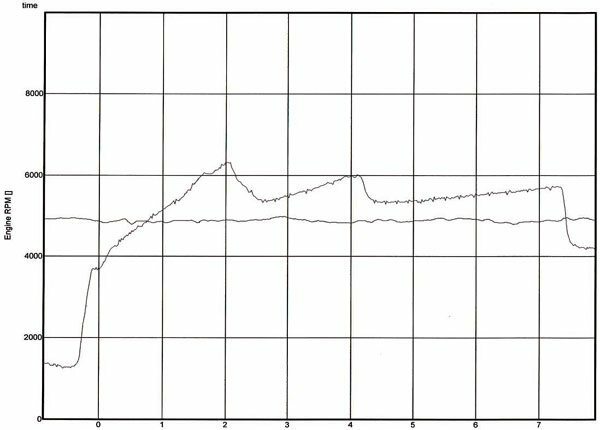 This one compares engine RPM (lower line) with system voltage throughout the run (upper line). As you can see, the electrical system maintained voltage steadily throughout the pass, proving the system is working just fine, as designed. 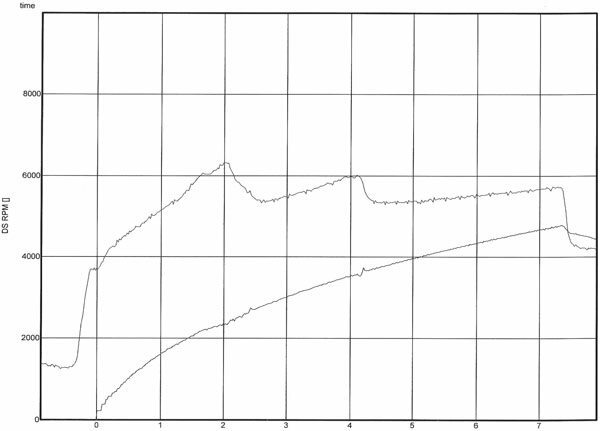 Graph C. Here’s another engine RPM graph, this time compared to the lateral g-forces pushing the car from side-to-side. Obviously, this was a nice, straight pass. In a road racing car, the lateral g-loads increase dramatically around every turn. Graph D. This engine RPM g-load graph is for acceleration (lower line). It shows the harsh g-load pushing aft at the start, and settling down as the car accelerated. It picks up a bit at every gear change, and then relaxes again. Looking at Graph B on page 124 you see there is no voltage drop at all. A consistent 13.2 volts were available throughout the entire run. My electrical system is working flawlessly. When we look at the Graph C on page 124, it shows that the car has a little sideways motion, but it’s not bad. Perhaps it could be the front-end caster settings and not necessarily the rear tires. I’ll monitor it in the future, and see if it’s a consistent issue. If it becomes more pronounced, I’ll know something is wearing out and requires service. If it goes away, I’ll know it was a one-time occurrence. Look at the Graph D on page 124. During the first .40 second of the run, an acceleration g-force of 1.40 was achieved and then steadily declined during the rest of the run. I can remember when I had my 1991 tube chassis-equipped Cutlass, the acceleration g-force was 2 to 2.4. The unit has to be mounted in a specific forward direction for the lateral and acceleration g-force meters to work properly. Just as important as maintaining your battery to peak levels for operation of all electronics, you need an ignition system that is capable of delivering a high enough voltage spark at all points throughout the run. Some ignition systems have extra capabilities besides just firing the spark plugs. I run the MSD Programmable Digital 6AL box. There are other MSD boxes that can also perform the following functions. Using a serial-port-to-USB-port adapter cable (provided) you can connect the box to your lap-top (if your computer does not have a USB port). This MSD ignition box has three built-in RPM limiters. There is no more need for a multiple selection of RPM chips or rotary dials. One RPM limiter is to control the engine under wide-open throttle (WOT). Those who have ever lost a transmission or torque converter, missed a shift, or shifted into neutral all while under full throttle know the importance of an engine RPM limiter. You simply select the RPM limit you want and enter the RPM at which you want the engine to be held. 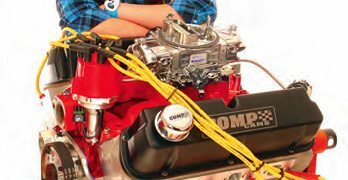 Since there is no need to run an engine past its peak-horsepower RPM, I would set the RPM limiter at 300 to 500 rpm above the peak horsepower point. If you have not dyno-tested your engine, I would set the RPM limiter at a similar 300 to 500 rpm above the highest engine speed obtained during your last run. The second RPM limiter is only used when you are running a transmission brake. The RPM limiter holds the engine at your chosen speed while the trans brake button is engaged. The third RPM limiter is my favorite, in that it limits the engine RPM during the burnout. It is tricky to maintain a steady RPM during a burnout while spinning the rear tires in water. With this RPM limiter being energized (along with the line lock) all you need to do is hold your accelerator to the floor and make some smoke. I would also put the trans in high gear before the burnout to lessen the engine RPM needed to get some good heat into the tires. MSD’s Programmable Digital 6AL-2 control box allows you to program in various RPM limiting functions for use at various places. The burnout RPM limit and an overall RPM limit are two good examples. 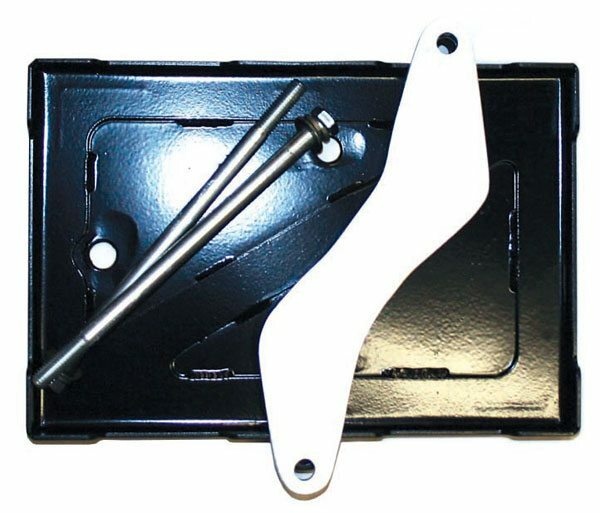 This box is essential in a car with a manual transmission to avoid over-revving the engine. 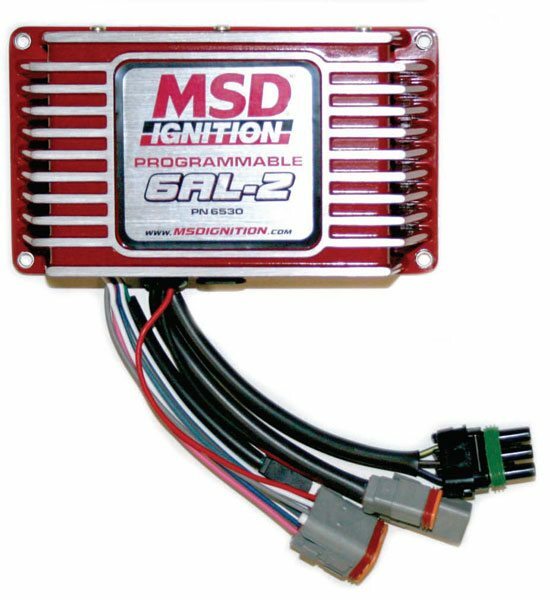 MSD sells complete high-performance ignition systems designed to deal with the high RPM, heat, and abuse typical of racing. 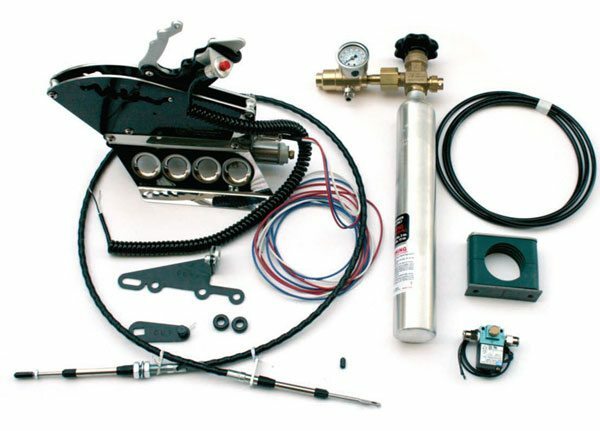 This particular kit includes everything from the distributor, coil, and spark plug wires to the programmable 6AL-2 box and additional RPM-activated switches. 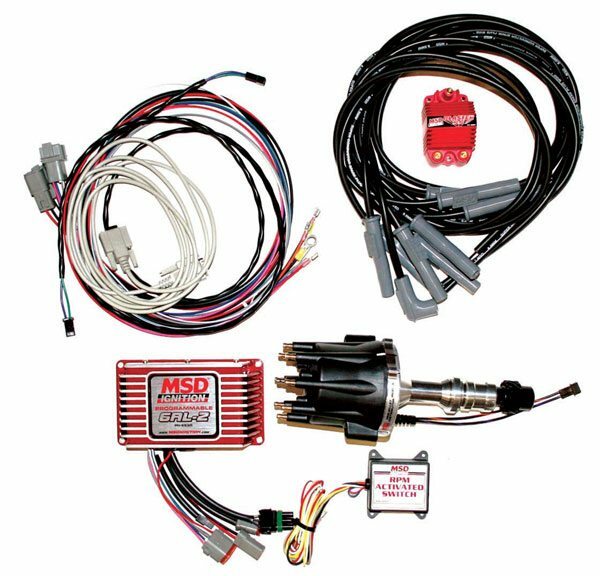 MSD offers complete kits like this for a wide range of engine families. 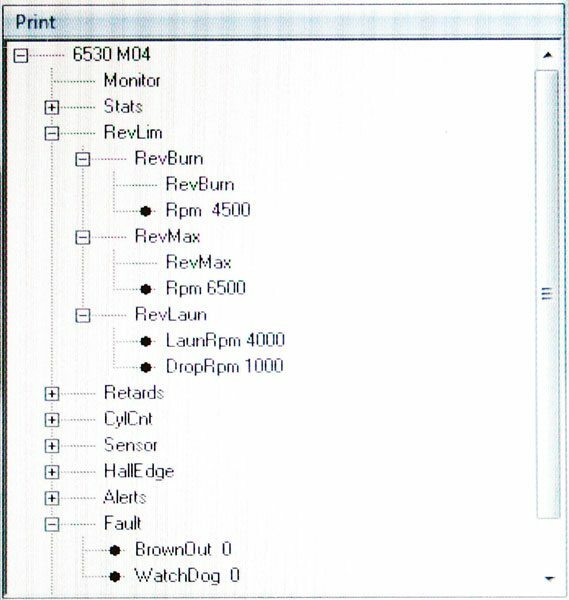 This screenshot shows the MSD RPM limits chart, as seen on a typical laptop. You can see the various RPM limiters and where they’re set. Changing the limits is as easy as changing the numbers on the screen. If you’re a serious racer, this is the way to go. 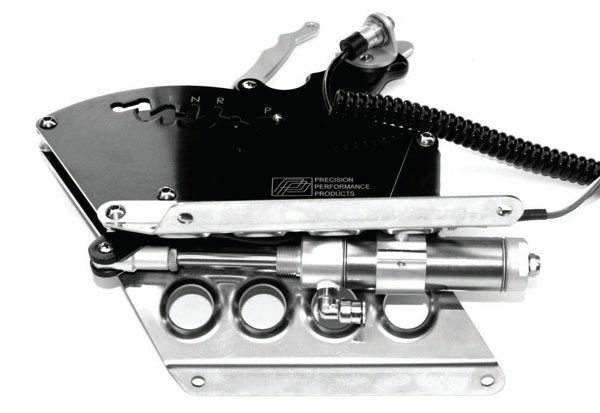 To give full timing control to the MSD computer, it’s necessary to disable the mechanical timing advance mechanisms (weights and springs) from your traditional distributor. This is called “locking out” the distributor, and it’s a fairly common and simple practice. Once you have completed the burnout, pull up to the line and pre-stage. I put the transmission in neutral and lightly rev it to be sure it is not loaded up with fuel. Then put the transmission in first gear and stage. With today’s ignitions, it probably isn’t necessary to rev the engine, but what it does is ensure that after the burnout is completed in third gear, the car doesn’t stage while still in third gear. Another benefit of the MSD Programmable Digital 6AL box is you can program your entire distributor timing curve also from your laptop. Timing curves are very tricky to set and even sometimes once they are set they retard or take out timing at a high enough RPM when you don’t expect it. The best way to set your timing is to throw away your distributor’s mechanical weights and springs that control timing advance and lock out the curve completely. This can be accomplished differently on different distributors. Trying this while running too much compression makes for a hard-starting engine. With the MSD Programmable Digital 6AL (a centrifugal advance but on your laptop) and your distributor curve mechanism locked out, set the timing at 4 degrees above where you intend to run it. Now you can set up the timing to always pull out 4 degrees of timing with your laptop. If you are ever in a situation (such as poor weather) and wish to add up to 4 degrees of timing, it’s simply a matter of plugging in your laptop and moving the timing line up however many degrees you wish. You can also retard the timing further (14 degrees) for starting the engine. Although the engine has a heavier lope to the sound with the timing retarded and sounds cool, you have full advance back in at idle if you are a foot-brake racer and leave the line at idle. If you are a transmission-brake racer, bring the timing to full advance at the RPM your engine sees while on the trans brake. Either way, there is no lag time when you leave the starting line to when the engine sees full advance. You can download this software at MSD’s Web site. This allows you to play with the software without making a purchase. One of the things I have found interesting with my MSD Programmable Digital 6AL, which I have never seen advertised, is you can use it to “dial-in a car.” You can remove timing throughout the entire run and slow the car down. As a test I removed 20 degrees of timing and my car slowed down .50 second in the eighth-mile. It was as consistent at the slower time as it was at the normal time. Sometimes when I go to a two-day event and race both days, I run it slow the first day. Then I speed it up for the second day (when you usually only get one time trial). That makes it hard for competitors who are really watching you to know what to expect from the car. Here’s another screen capture from the laptop. This one shows the timing advance program with a locked-out distributor in place. Note that the timing is set at 40 degrees, with 4 degrees of timing retard plus 14 more degrees of retard programmed in for starting only. Once the engine is started, all of the timing advance comes back in at 1,400 rpm. It sounds complicated, but it’s much easier than wrestling with weights, springs, and vacuum advance cans like we used to. If you are running nitrous oxide, you can tie into the nitrous wiring so the box retards the timing instantly. Once you have all your settings where you want them, select “upload to the MSD box” on the screen, and that’s all there is to it. These are a few of the more important items that I have found over the years worth looking into. During an event, there are many things to keep track of and many decisions to be made. Of course experience helps, but the more data you have from your car, the better the decisions you can make. Strive to be consistent not only in your ET, but also in your staging and reaction times. Once you have accomplished this, you will win races.